The very concept of architecture could be misleading both the public and the profession. 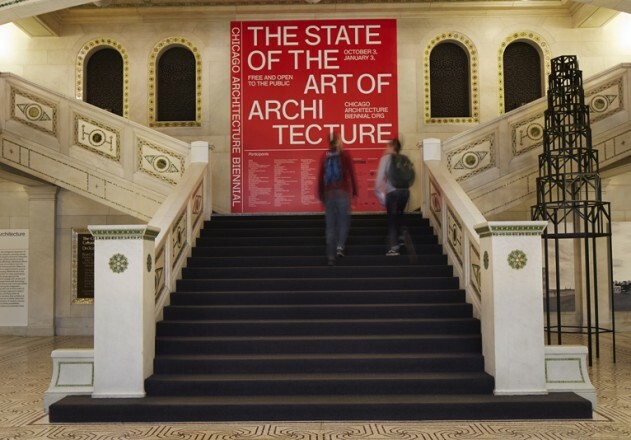 "The State of the Art of Architecture" is the theme of the Chicago Biennial, on view now til January. Photo by Steve Hall. In July, I wrote that when architects use the bodies of specific women such as Marilyn Monroe or Beyoncé as "inspiration" for buildings, they objectify both women and architecture. Many readers didn't like this: "Anyone complaining about where an artist gets thier [sic] inspiration dosn't [sic] understand what an artist or art is," protested one. "What's wrong with using the female form for artistic inspiration?" asked another; "I can think of nothing more beautiful." And another: "Music, Structures, Paintings, anything artistic is not degrading. It's beauty." The message: Architecture is art, and where artists get their inspiration isn't up for debate, since it's personal to the artist. Huffington Post readers aren't alone in this view, of course. "Architecture is art, nothing else," architect Philip Johnson once declared, and Pritzker Prize winner Richard Meier claims that architecture is in fact "the greatest of the arts." In 2011, President Obama observed that architecture at its best becomes "works of art that we can move through and live in," and the Chicago Architecture Biennial, going on now til January, is themed "The State of the Art of Architecture." If architecture is art, what is "art," anyway? "Art as we have generally understood it," writes Larry Shiner in The Invention of Art (2003), "is a European invention barely two hundred years old." Originally stemming from the Latin ars and Greek techne, the word meant any craft, from joinery to haberdashery, performed with skill. In 18th-Century Europe, the meaning shifted from the practical to the esoteric: "The fine arts, it was now said, are a matter of inspiration and genius and meant to be enjoyed for themselves in moments of refined pleasure." Art for art's sake. By extension, architecture for architecture's sake. "STOP confusing architecture and art," demanded Patrik Schumacher, Zaha Hadid's partner, on social media last year: "Architects are in charge of the FORM of the built environment, not its content... Architecture is NOT ART although FORM is our specific contribution to the evolution of world society. We need to understand how new forms can make a difference for the progress of world civilization." Schumacher exposes the most common conceit among architects. We claim that "new forms" benefit "the evolution of world society" and "the progress of world civilization," although we rarely explain how. Ironically, the most celebrated architects actually use evermore exotic geometries for the opposite purpose--to broadcast their personal interests. And this is exactly why architecture is considered art. "In the Western world," writes Priscilla Frank, the Huffington Post Arts & Culture editor, "art and self-expression are often thought of as going hand-in-hand." About.com, supposedly the "largest source of expert content on the Internet," backs this up: "Art is usually about self-expression." PBS agrees: "The essence of art is expressing oneself." The Spectator recently called Hadid "the champion of an architecture that was more about personal 'vision' than public utility." Fast Company has called Frank Gehry, certainly the world's most famous architect, "the avatar of architectural self-expression," and Gehry himself staunchly defends "the validity of self-expression" as "a basic value." This year, the Architectural Review declared that both architects' recent projects "arrogantly flaunt their refusal to defer to local context ... announcing instead that the supposed right to ego-expression of a starchitect trounces all such decencies." Consider this: When Chinese builders began copying one of Hadid's designs a couple of years ago, she reportedly looked into legal action, as have other designers under similar circumstances. Yet, if architectural forms genuinely are meant to benefit society, as Hadid's own partner claims, more form presumably means more benefit, so what's the objection to it being replicated? At worst, the designers already had been compensated, so what's the harm? Wouldn't they actually want to give away the concept, as Elon Musk has done with Tesla's IP? Maybe "new form" is less about social progress than it is about self-promotion. As Frank Zappa put it, "Art is making something out of nothing and selling it."